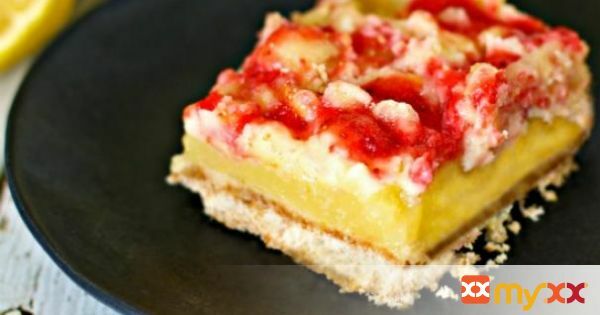 These made from a mix Strawberry Lemonade Cheesecake Bars are 2 AMAZING dessert recipes in 1! 1. Preheat oven to 350°F. Lightly grease an 8x8” baking pan with non-stick cooking spray. 2. Place strawberries, 1 teaspoon lemon juice and ½ cup sugar into a blender. Blend on high until well blended. Set aside. 3. In a small bowl, stir together the lemon filling mix pouch, 3 eggs, water, lemon zest, 1 teaspoon lemon juice and 2 teaspoons sugar with a whisk until well blended. Set aside. 4. Place the complete crust mix pouch, graham cracker crumbs and 1 tablespoon melted butter into a medium size bowl and stir well with a fork. Press the mixture into the bottom of the pan. Bake for 10 minutes. 5. In another medium size bowl, combine the cream cheese and ½ cup sugar using an electric mixer on low speed until smooth. Add 1 egg and vanilla, and then continue to mix until well combined. Pour the cream cheese mixture evenly over the hot crust. Pour lemon filling over cream cheese layer. 6. Bake for 25 minutes and remove from oven. Drop spoonful’s of the strawberry puree over the top of the cheesecake layer (which will rise to the top) and use a knife to swirl the strawberry mixture into the cheesecake mixture. There will be some left over to spoon over the top later. Bake an additional 10-15 minutes until done. Cool completely at room temperature. Refrigerate and cut into squares. Best when served chilled.